Vakha and Yusup were roaming slowly around the courtyard of a five-storey apartment block. Their camouflage jackets were open and their AK-47 rifles dangled easily and familiarly, almost touching the ground. As they moved from one checkpoint to another, the two traffic policemen were taking the chance to have a short break. They used these courtyards as a shortcut between two main avenues. For three days now they had been taking part in a special operation in the city to eliminate tinted glass windows, and were assigned to a military law enforcement unit. Now, after all the hours of wrangling with drivers who refused to strip the tint film from their windows, their eyes were dim and their voices were hoarse. Vakha looked up. On the building’s second floor he saw a patch of black. At first he thought it was another vision of his overcharged brain. The glass door of on the balcony of one of the apartments was completely covered in tint film. “The rats, they've got a cheek. Found a cosy spot to hide in, I expect,” Yusup growled. “We won’t let them,” Vakha said firmly, with one foot on the first step of the wall ladder, and looking up to prepare his climb to the balcony. The tiredness was forgotten. The two colleagues were seized by the excitement of the hunt. In no time at all they were up on the balcony, hammering on the locked and tinted door. A few minutes later the door opened slightly and the frightened face of a man appeared, stunned by the sudden appearance of these "guests". Without waiting for questions, the policemen took the initiative. The pale face of the man in the doorway turned red, but he was unable to get anything out. “Or your house register,” suggested Yusup. “Yes, your house register,” Vakha echoed. The apartment’s occupant finally found his voice, which turned out be unexpectedly loud and confident and did not correspond to his initial look of fear. “Who are you? What’s your authorization? Do you know who I am?” With these words the man produced a small red book from an inner pocket. “The President said everyone has to remove all tinting of their windows – even his own cousin,” Vakha said, moderating his tone. At this, the embarrassed policemen leaped down from the balcony, not bothering to seek a convenient method of descent, and Yusup bruised his leg slightly. Of their recent relaxed mood there was now not a trace. The altercation with the "offender" and Yusup’s bruised leg had left them both in a state of quiet rage. Now they looked for anyone on whom they could vent it. As they emerged onto the avenue the first thing they saw was a Lada Priora, with all of its windows tinted. The car was moving along near the kerb, its windows gleaming with dull blackness. Without consulting each other the two colleagues rushed at it, motioning to the driver with their AK-47s to pull into the side of the road. The car pulled in at a vacant space by the kerb and stopped. On the driver's side the window came down. Vakha looked inside. The driver's face was half-concealed by a white mask. The face of the woman passenger was also obscured – by the end of a trailing headscarf. But by now Yusup was reeling off the usual patter: "Presidential decree ... violation ... tinted all over...” and seemed not to have noticed the strange appearance of the people in the car. This unquestioning acceptance further confirmed Vakha in the view that the people in the Priora were up to no good. “We’ve got our faces covered because of the flu epidemic in town,” the driver said, as if in reply to an unspoken question, and it seemed to Vakha that he looked at him with a grin. "It’s a disguise,” Vakha thought. 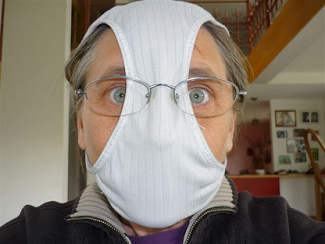 “I mean, who in Chechnya would wear a mask against flu? This isn’t China, after all," he pondered, remembering pictures from last year's television program about bird flu. Meanwhile Yusup had got out his pocket knife and was starting to scrape the tinting film off the car’s rear windows. Five minutes later the cleansing of the car windows was complete. The people with covered faces were now clearly visible from the outside.